The Alpha lenses from the digital still lineup are already designed to resolve far, far beyond the 2 Megapixels of 1080i60 HD video. So you probably won’t see different lenses than will be available in the consumer lineup, but it does open the door to the entire Minolta Maxxum line of SLR lenses, which are the basis for the Sony’s Alpha. 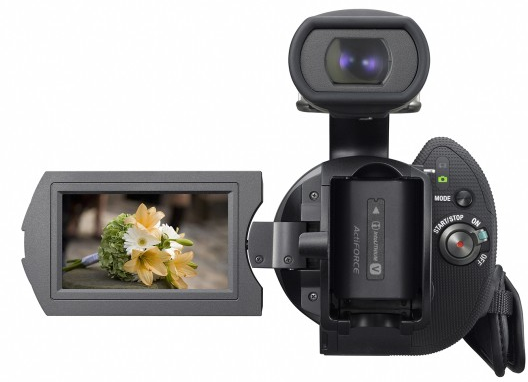 SAN DIEGO, June 13, 2010 – Following the 25th anniversary of its industry-leading Handycam® product line, Sony today announced the innovative NEX-VG10 Interchangeable Lens HD Camcorder. The new NEX-VG10 is the world’s first consumer camcorder with interchangeable lenses and the first Handycam camcorder to feature an extra-large Exmor™ APS HD CMOS sensor. Only true because the Z7 was never consumerized. If there were a consumer version of the Sony Z7, then that would have been the first interchangeable lens CONSUMER camcorder. This is all just semantics, though. By not counting the consumer digital still cameras that shoot HD, or the prosumer HD camcorders that shoot HD. The operator view. LCD a bit smallish, but it's consumer, right? Included with purchase as a download voucher ($99 value), Sony Vegas® Movie Studio HD Platinum 10 video editing software includes powerful tools for video compositing, color correction and sound mixing to produce cinema-quality HD movies with ease. You can also share your creations via DVD, Blu-ray Disc™ media, or upload to the web – all from one simple program. Suddenly, Adobe CS5 and Apple FCS have some competition. This continues the downward push of software pricing that begs the question of Sony shooting themselves in the foot by offering such a complete package for $99. Is that what they feel is the value of their entire authoring solution? UPDATE: I’ve been corrected that this is a consumer version of their authoring suite. Sort of like iMovie, iDVD, etc, but with the Sony software suite. Interesting that it does full-on Blu-ray authoring while Apple’s consumer and professional optical disk authoring solutions continue to have zero Blu-ray capability. The NEX-VG10 accepts both Memory Stick PRO Duo™ (including Memory Stick PRO-HG Duo™) and SD (including both SDHC and SDXC formats) media. Users can record up to four hours of high definition footage (1920×1080, FH mode) when using the 32GB memory card. This dual media capability similar to the prosumer NX5, but the ability to handle the SDXC format is a nice addition. I’m fine with Sony continuing to promote their proprietary media as long as they continue to offer end users the ability to use alternative media as well. I would have also liked to see a higher data rate that would reduce the artifacts that AVCHD imparts onto full HD video by trying to squeeze it into a thimble. Lets keep our fingers crossed that a pro model isn’t far behind with a higher data rate. This isn’t too much a stretch for Sony who already manufacture several 35 Mbps camcorders. Sony’s Memory Stick PRO-HG Duo HX offers an industry leading 30MB per second transfer rate, which means Handycam users can upload video clips in a fraction of actual playback time. It would be nice if they went to Compact Flash which has already been tested with transfer rates over 80 MBps, to really make downloading big files go very quickly. But I completely understand them wanting to keep Sony media faster than SD cards, and keeping the form factor smaller. It’s not like they increased the data rate beyond standard AVCHD, unlike what we can now do with custom firmware in the Panasonic Lumix GH1. Get rid of all the banding and visual crap from such heavy compression of the HD image by lifting the data rate cap. “Consumers, prosumers and professionals have been capturing cinematic (i.e. shallow DoF) full HD movies with premium stereo sound for some time now with vDSLR’s and we decided to try and offer them a video camera that has the big sensor to see if they’d bite on a real, dedicated video camera that happens to also shoot big stills,” notes Anthony Burokas, publisher of the TechThoughts blog. 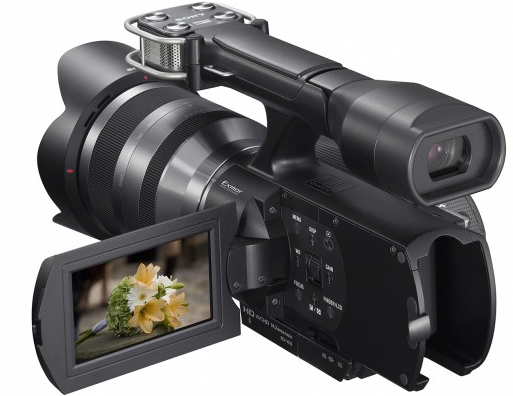 “The key difference here will be that all the extra gadgets and accessories that are needed to make vDSLR’s usable on a real production won’t be needed with the VG10 because it’s a real video camera.” Will it have live HDMI out with full HD? Audio metering and controls? No moire or aliasing? Then I’m sure people will definitely bite. Sony’s NEX-VG10 Interchangeable Lens HD Handycam® Camcorder is equipped with the same Exmor™ APS HD CMOS sensor used in the “NEX-5” and “NEX-3” digital cameras and compatible with the high grade “E-mount” series of smaller, lighter lenses optimized for video shooting with silent operation and AF. It is also compatible with a wealth of “A-mount” interchangeable lenses used by Sony’s existing α DSLR camera lineup via a mount adapter (sold separately), including award winning Sony G Lenses and Carl Zeiss® branded lenses. Another thing to consider is that the sensor (and seemingly a good part of the menu system) is coming from the NEX still camera line, which have a very good ASA performance- very low noise at higher ASA’s. Now, they’re no Nikon or Canon 7D, but it begs the question— if you adjust ASA ratings in the film cameras, (and the high end digital cinema cameras) and the digital still cameras, how come the video cameras are still using stupid “Gain +3” settings that mean nothing in the real world? How about we get what the NEX-5 settings so that, when we need more light, we set the VG100 to an ASA of 800, or 1600, or 3200, or even 6400 which in still camera tests, looks pretty darn good. Plus, then we can talk with photographers shooting the same subjects (movie sets and the like) and we can compare settings. It puts us on the same playing field by measuring light the same way. No more, “gain” settings that mean absolutely zero to every other imaging professional. Coupled with Sony’s powerful BIONZ® processor, the camcorder’s Exmor™ APS HD CMOS sensor realizes high resolution video and 14 megapixel still images. Approximately 19.5 times bigger than the standard sensor found in conventional camcorders, the APS HD CMOS sensor enables an extremely shallow depth of field. This allows videographers to achieve cinematic results with stunning background defocus (bokeh). Users can also enjoy DSLR-quality photo capture with features like Auto HDR, Handheld Twilight, and Anti Motion Blur, as well as catch fast action sequences with a continuous burst rate of up to seven fps. The real question is if there is an optical low pass filter to eliminate moire, and aliasing problems that plague vDSLR users. In Arri’s new digital cinema camera brochure, they devoted nearly a whole page to the OLPF. It is that important. The NEX-VG10 can capture full 1920×1080 high definition video at up to 24Mbps for amazing clarity and detail, ideal for recording on to Blu-ray Disc™ media. It also comes with an E-mount 18-200mm lens optimized for video shooting that offers a powerful 11x optical zoom in addition to a silent auto-focus system and Optical Steadyshot™ image stabilization with Active Mode for superior versatility. Put a big battery in there and it MIGHT just be balanced in your hand. This looks very exciting! Satisfying the needs of serious videographers, sound quality matches the stellar imaging performance of the NEX-VG10. Its Quad Capsule Spatial Array Stereo Microphone uses advanced processing algorithms to combine signals from four individual microphone capsules. The result is exceptionally clear stereo audio with high directional response, allowing videographers to capture more sound from their subject and less background noise. 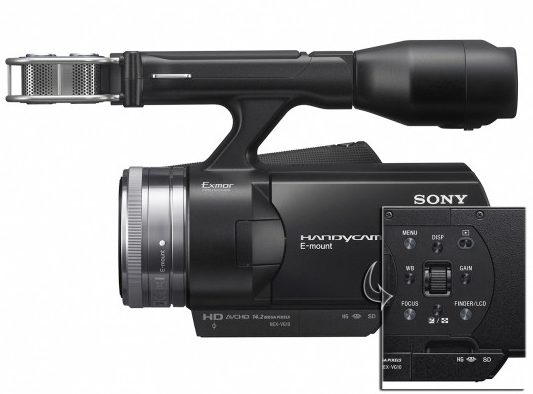 The camcorder also features dedicated inputs for optional external microphones and headphones to monitor sound levels. What, four mics and we can’t record surround sound? No, really?!? Okay, I like the concept of using noise canceling from the rear mics to make the front mics perform better (something pros have been doing with rear-facing mics on their cameras for decades) but there was an incredible opportunity here for immersive audio on capture. The camcorder’s TruBlack™ technology brings remarkably higher contrast and brightness to its 3.0″ Xtra Fine LCD™ swivel display, delivering more natural, realistic colors and easier viewing in bright conditions. The LCD is supplemented by a high-resolution adjustable electronic viewfinder that helps framing, monitoring and capturing clear images. I look forward to seeing it. And, honestly, if the prosumer version has a waveform scope built into it, that’ll be plenty good for me. But as Sony starts to move their portable broadcast monitors to OLED technology, you have to wonder if such a NEXt-generation camera like this isn’t deserving of the OLED love. Compact and easy to handle, the NEX-VG10 gives videographers the flexibility of a removable lens with the ergonomics and operability of a Handycam camcorder. An intuitive jog dial and hotkeys make it easy to navigate menus and adjust shooting parameters, including full manual control of Iris, Shutter Speed, Gain and White Balance for professional results. Honestly, the one thing I do not need my professional camcorder to be is compact. But I’m sure the prosumer model of this will be the same size. It’s clear they’re really done their homework on this one and I hold hope that the “compactness” will not be the ergonomic nightmare their NEX still cameras are. The NEX twins have a beautiful — but horribly designed — user interface that requires way too much button-mashing to accomplish even basic tasks. The ultra-small design of the camera doesn’t help matters, either: everything is menu based, with no mode dial and few direct buttons. As much as I like what the NEX-5’s photo quality, feature set (for the most part), and performance, working with the camera is frustrating, not fun… The camera’s small size also compromises its usability: there’s no mode dial, the grip is small (and slipper), buttons are scarce, and there’s little room for your fingers (which can block the microphone or smudge the LCD with ease). This minimalist design also forces you to use the NEX’s attractive, but very poorly designed menu system for nearly everything. I went into detail about why I don’t like the menus earlier and, if you’ve read any other reviews on the Web, you know that I’m not the only one who feels that way. So bigger is, in the professional world, better for usability. Let’s hope Sony resists the urge to make it too small because, well, the inventors of MicroMV darn sure know how to make things small. I like two accessory shoes. Where else could you ptut the wireless mic receiver? Dual accessory shoes (Alpha Hot Shoe/Universal Cold Shoe) allow for many still photography and video accessories, such as the ECM-CG50 shotgun microphone and external flash lighting. There’s also a choice of rechargeable battery options, including the NP-FV100 that provides up to 315 minutes of continuous HD shooting (may vary), and a specially designed soft carrying case. Alas, not the Infolithium-L they’ve used for 15 years. It’s a new variant, the Infolithium-V. Plus, it looks like we can use the hot and cold shoe at the same time. i.e. a Sony accessory (like a LED camera light) and a wireless mic receiver holder. I wonder if the Alpha Hot Shoe can be used as a cold shoe too? Price and Availability The NEX-VG10 will be available in September for about $2,000 and presales on http://www.sonystyle.com will begin July 14. They will also be available at Sony Style® retail stores and at authorized dealers nationwide. A $2000 pricetag (LIST!) is very sweet indeed. I’m soooooooooo tempted to preorder right now, but I hold hope that a prosumer model will be announced in the near future with the customary tweaks that Sony has used numerous times in the past. It also needs Waveform scopes built in, live HDMI out & multiple outputs live at the same time, multiple frame rates (1080p30, 1080p24), and (probably most importantly) the pro model needs a higher data rate. These are several of the major problems with vDSLRs today. If Sony plans on stealing that market, they need to look at the problems professionals have using competing products, and then design the solutions into this camcorder. Make a product that works, and workers will buy that product. I give this one a strong thumbs up based on what I see so far. Lets hope they don’t screw up the menu system like on the digital still cameras, and lets hope that a pro model is not far behind giving us those extra features that really make it integrate nicely into our workflow. UPDATE 2: Engadget has a hands on with 33 photos. UPDATE 3: New Vimeo Video that shows off the camera, including the first shots of the lens adaptor in use. Thankfully, Sony has included the same anti-dust technology as in the NEX single-lens direct view cameras, combining a charge protection coating on the low-pass filter, and an electromagnetic vibration system that aims to shake stubborn dust particles free. I don’t exactly know where Imaging-Resource gets their info, but they’re the first I’ve found that mention anything about an optical low pass filter- which is exactly what would eliminate the moire and aliasing that plague the vDSLRs that shoot HD video. The problem is that, if an OLPF i designed for HD video, then it’s going to stop increased resolution around a 2 Megapixel image. Yet this camera touts 14 Megapixel stills. And in the close up shots of the sensor in the various videos, I don’t see a filter that swings in front of the sensor when shooting video, but swings out of the way for still images. So, without that, I really doubt there’s an OLPF, or else there’d be no reason to ever take a 14 MP photo with the camcorder because it would blur out all detail above 2 MP (the resolution of the 1920×1080 HD frame). Don’t miss a TechThought. E-mail subscriptions now available. Thanks for this overview, the best write-up so far on the Web. Additional thoughts are that I wish there were connections for Sony’s proprietary remote control and Active Interface Shoe accessories. Also, I doubt that raising the bitrate ceiling on AVCHD is within Sony’s control at this point in the codec’s evolution. Regarding your thought on product dilution of the Vegas line, I don’t think that giving away the crippled version of Vegas (compared to Vegas Pro) will pose much of a problem for Sony, since the target market for this camera will include mostly people who prefer something more like Premiere Pro or Final Cut Pro. Lastly, I’m disappointed that Sony did not go with a touchscreen interface (like their HDR-XR5xxxV products) to facilitate pulling focus which will be, of course, an even greater challenge with the shallow DOF here. Put the camcorder lens on there with the 11x optical zoom. Where’s the camcorder’s zoom rocker? I can understand no camera control of zoom on still lenses, or through the converter, but with the included lens, there’s no smooth ramping zoom control? whaaa? No remote control of focus, iris, zoom, or anything? Or are you now supposed to go get all the external control systems that the vDSLR guys have to use? 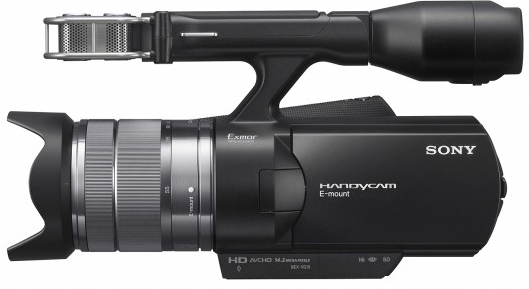 Does it defeat the purpose of making a large-sensor camcorder if the conveniences of a camcorder aren’t there? Saw that Engadget video when it broke. And man, is it ever broken – what a garbage camera operator. IEBA, if you can swing $25,000 and up, you will have the exact same spec’d video camera you are now describing readily available for you. No need to wait until September, dig? 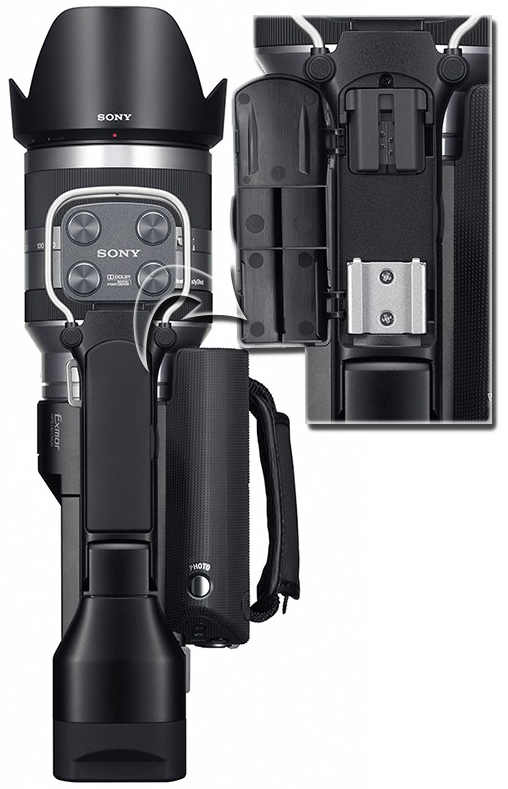 Sony sells more expensive cameras too, you know, but for more money than this one priced at $1,999.99. Putting it yet another way — you want more features, you’ve gotta pay more for it, see? Your right on the LANC. A complete marketing oversight on SONY’s part. Shame on Sony’s loss of foresight. The Pancake lens pack would even allow for a parallel style 3d rig. Sony needs to hire a proper Think Tank if they want to dominate the 3D space over Samsung, Panasonic or the DLSR guys. Really want this camera even though I just bought a Sony! They are also missing handle-set controls for when shooting using the carry handle. And does it look like that you need to open to LCD to select which mode to shoot in? what craziness is that?